What’s breathtaking about autumn is how the leaves transform from rich green to warm, golden and crimson hues. 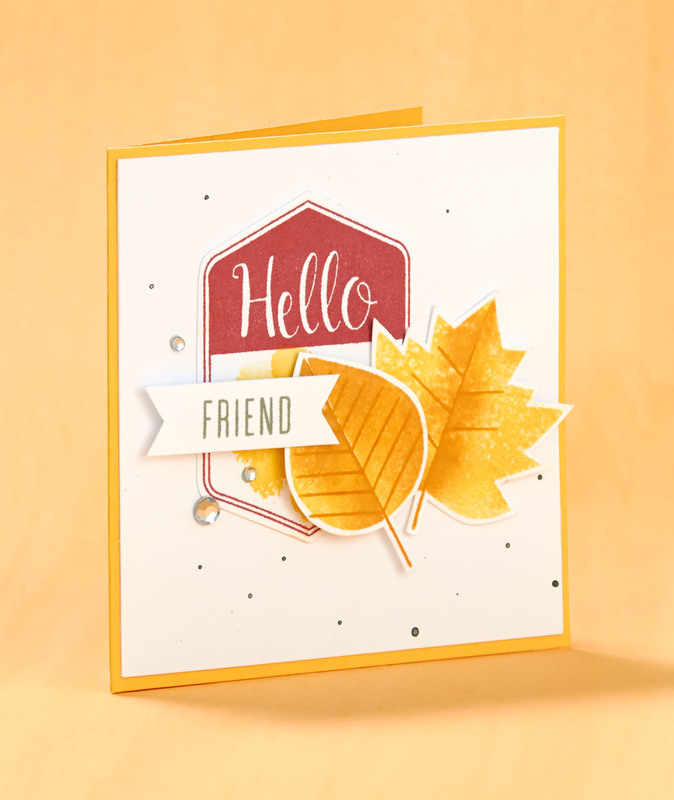 This first baby wipe trick is perfect for capturing the beauty of autumn leaves because it lets multiple colors bleed into each other to create that tonal effect—all on one stamp! To create these leaves, our artist first squeezed Canary Exclusive Inks™ re-inker onto a baby wipe. Then she squeezed a few drops of the Goldrush Exclusive Inks™ re-inker over parts of the Canary-colored wipe. After creating the ink pattern she wanted, she pressed the stamp onto the baby wipe, and stamped the image onto White Daisy cardstock. Essentially, for this technique, you create your own stamp pad using our re-inkers and a baby wipe. Pretty neat, right? Now, you may have noticed that the veins of the leaves have more definition. That’s because after our artist stamped the baby wipe image, she dried it with a craft heater, and then she stamped over it again using the Goldrush Exclusive Inks™ stamp pad. As you may have guessed, our artist used the first baby wipe technique to create the blossom petals that fade from Honey to Glacier. But how did she create that beautiful brushed background? Again, that look’s achieved with a baby wipe! 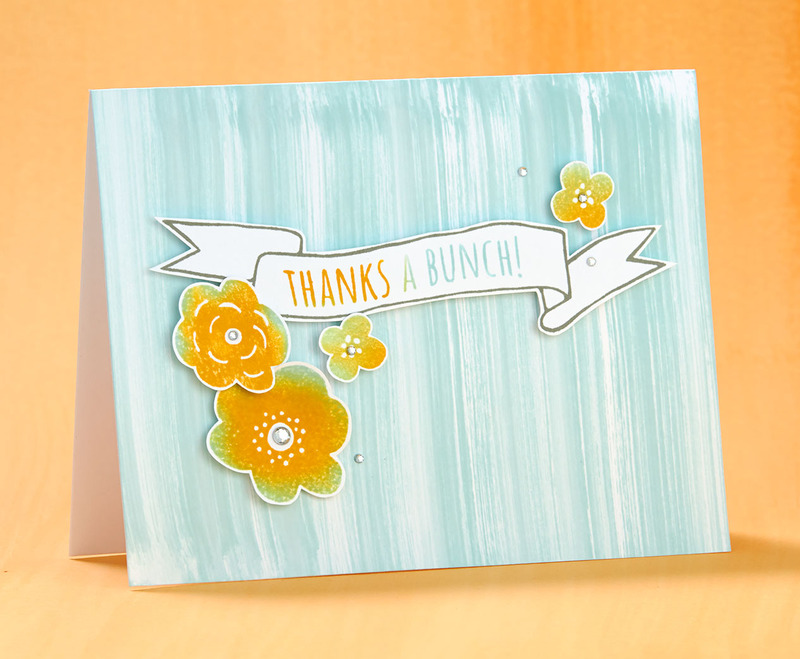 For this effect, our artist squeezed the Glacier Exclusive Inks™ re-inker onto a baby wipe and simply swept it over some White Daisy cardstock. Try this out at home for easy texturized paper. Play with how little or how much ink you add to the wipe to create a myriad of different looks. What a fun way to add a splash of color! When used with an intense color, like Thistle, this technique creates what looks like a paintbrush stroke. And here, it really draws the eye to what matters most: the message of appreciation that communicates the reason for giving someone this card in the first place. Even though this technique takes only seconds to do, its “wow” factor will last much, much longer. Well, there you have it! 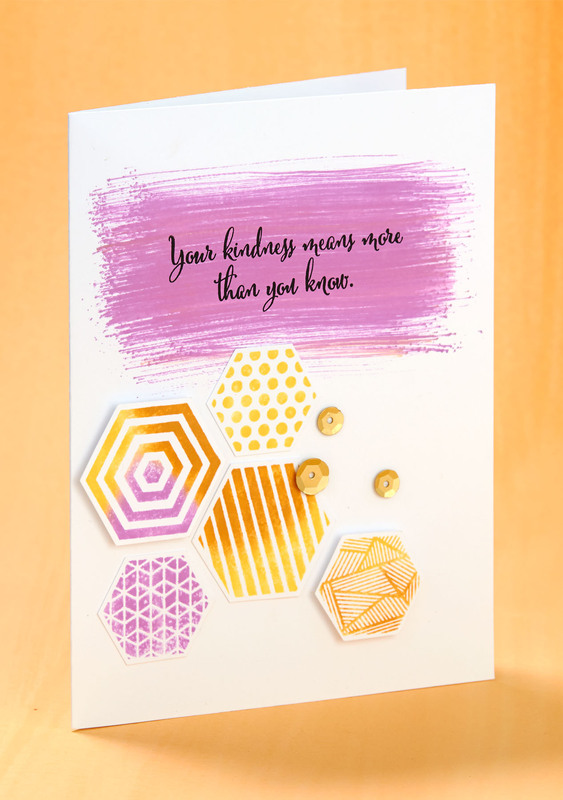 Add another stamping skill to your repertoire! We love using baby wipes to create vibrant artwork, and we know you will, too! Who would have thought, using Baby Wipes in a stamping Technique! Love all the ideas. Another awesome way to use baby wipes. Who would’ve thought of using baby wipes for inking & stamping techniques. Wow. Love this technique. Tried it yesterday & love it. Love the depth this gives! Awesome. Definitely will have to try this. Awesome effect. Am so gonna have to try this. Thank you for the ideas.